Are you Ready to GO WILD? Mount Olive will be “Going Wild” on a Faith Journey in the Big Jungle Adventure. There will be classes for age 3 years through 4th graders. 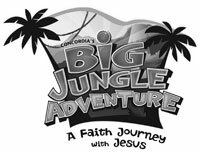 The Big Jungle Adventure Vacation Bible School will be held Sunday – Thursday, June 19 – 23, 2011 from 6:00 pm to 8:30 pm with a light dinner at 5:15 pm. Youth (5th – 12th graders) are invited to help with classes, crafts, games, skits, and/or taking pictures. There will be an adult Bible study as well taught by Pastor Sizemore. There will be a nursery for children 2 and under whose parents want to help or attend the adult class. VBS training will be held on June 5th following the 2nd service. Lunch will be served. Volunteers are needed to transform our fellowship hall into the Big Jungle Adventure on June 17th at 6:30 pm. Snacks will be served. We had an amazing time zipping, zapping and zooming for Jesus last year at Mt. Olive VBS and we look forward to an amazing time again this year. Mark your calendar for the BIG ADVENTURE! If you are interested in volunteering for this adventure, please contact Mandy Kibler, VBS director.